I have never been a big fan of cabbage: let’s just get that out there in the open. Cabbage and I have a surface-level friendship at best, one whose stilted conversations (at mandatory social functions such as summer barbecues and family reunion picnics, etc.) are fraught with long and uncomfortable silences. Oh, hey Cabbage– I acknowledge your existence as a vegetable… I guess. [extended pause while Cabbage and I telepathically affirm our decided lack of common ground.] Well, I’ve got to go now. Have a good day, and easy on the mayonnaise! I have never ordered coleslaw in a restaurant or made it myself at home, and cabbage is definitely not at the top (or even at the bottom) of my grocery list. Cabbage is like the Ugly Duckling of the vegetable kingdom; the socially awkward kid you used to say hello to in the hallways at school just to be polite; the stinky and inexpensive last-resort foodstuff; the least glamorous item in the produce aisle. No seriously, Dana– tell me how you really feel. It is in this context of general cabbage hating that I inexplicably launched into making my own Countertop Sauerkraut a short while ago. Yes, me! And cabbage!! Who knew that I– She of the Cabbophobia and Upturned Cabbage Patch Nose– would ever purchase copious amounts of the green stuff, ferment it in a jar, and then actually attempt to eat it, all the while praying that I wasn’t going to contract some deadly strain of food poisoning? Never say never, my friends: Never say never! Of course, this was all undertaken as part of my Personal Beauty Detox Journey. Kimberly Snyder provides a recipe for what she lovingly refers to as “Probiotic and Enzyme Salad” in her book. I was all excited to try this exotic-sounding dish until I realized that it was basically cabbage. Fermented cabbage at that. Blech. However, in the spirit of trying new things and blossoming into a shimmering goddess of radiant health, I forged ahead with the recipe and made my own, honest-to-god raw sauerkraut! (Naturally, with some pitfalls along the way. What else would you expect from me? Almond milk, anyone?) Allow me now to outline how I managed to eff this really simple recipe up not once, but twice, before finally getting it right. Heh. 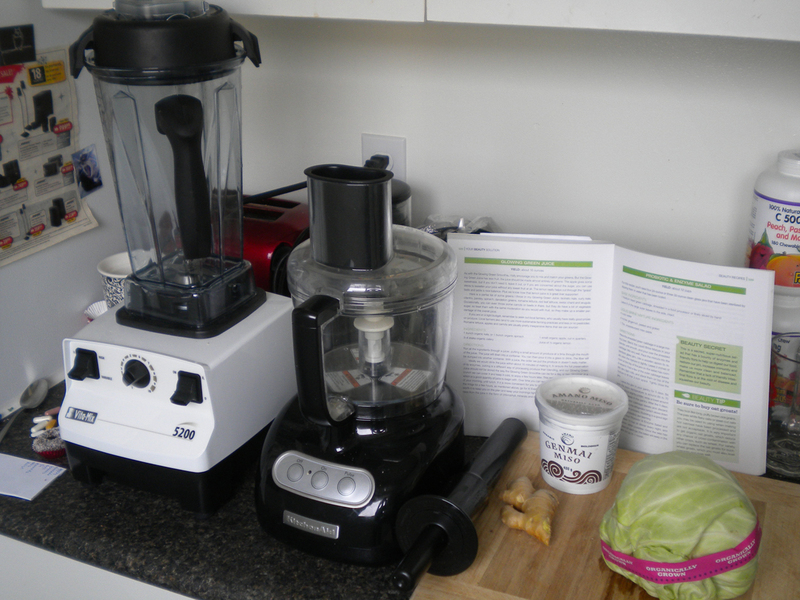 My Vita-Mix blender and KitchenAid food processor: partners in crime! My first mistake was purchasing a medium-sized cabbage that apparently wasn’t “medium-sized” enough. Thus, my inaugural batch of sauerkraut ended up looking like shredded cabbage soup in the jar– there was a ton of liquid and not nearly as much cabbage. Something about this looks a little… off… no? The recipe is supposed to yield 12 cups of sauerkraut. My modest-sized cabbage was on par to yield me 3 or 4-ish cups of kraut and 4-5 cups of brine… if I was being overly generous with my cabbage tally and grossly underestimating the amount of liquid I’d have left over. Is this how my sauerkraut is supposed to look?, I asked myself doubtfully as I tucked my jar of sloshing liquid into the back of a kitchen cupboard. For some reason, I think this is supposed to look more cabbage-y. Yes, this definitely doesn’t look right. Finally, after ten or so days of stealing wary glances at this jar of suspicious liquid, the moment of truth arrived: it was time to eat a half-cup of the fermented kraut with my dinner. Could I do it? Could I overcome my lifelong aversion to cabbage? Would my decision to eat fermented cabbage come back to haunt me in the form of food poisoning, violent projectile vomiting, chills, fevers, rashes, or even an untimely death? Nope! (Obviously, it didn’t kill me, since I am still alive– enough– to tell you this tale.) 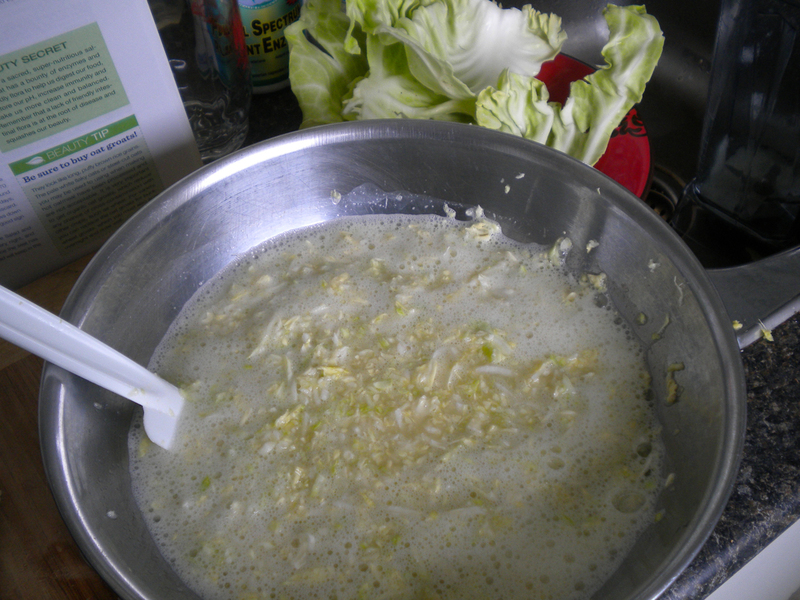 I ate the kraut, after fishing some lonely cabbage flakes out from the virtual pond of brine. Amazingly, it was delicious! Super delicious, in fact– I was beyond surprised! Emboldened by my success at Winning Sauerkraut (despite technically failing the easiest sauerkraut recipe on the planet), I went ahead and made another batch. 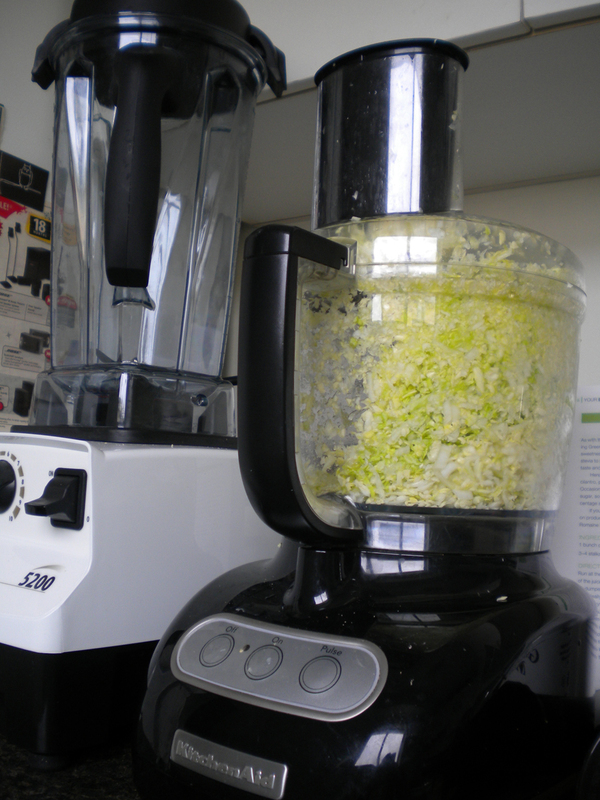 The shredding of the cabbage and the mixing of the ingredients came so easily and naturally the second time around– I was sure I was going to be a Sauerkraut Making Professional. Everything fit so snugly into the cuter jars. My cabbage looked so great and perfect when I lovingly tucked it into my kitchen cupboards to ferment. I win countertop sauerkraut!, I announced to myself as I washed the prep dishes afterward. I deserve silent congratulations and a symbolic pat on my own back! When I went to check on my jars after 24 hours had elapsed in the cupboards, I noticed that they were sitting in small puddles of liquid. It was then that it dawned on me, the Perpetually Slow Learner, that I had possibly– nay, definitely– packed my cute, small jars too full of cabbage and brine. The fermentation process had started, but there was not enough breathing room left in the jars for the mixture to properly expand. Something would have to give, and that something would most likely be glass. Images of shattered mason jars and shredded cabbage all over my kitchen cupboards came to mind. 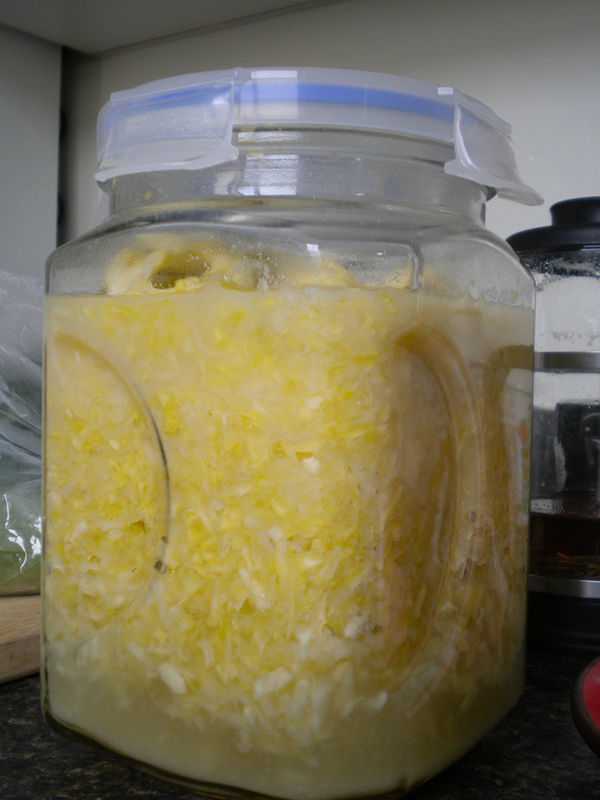 I resigned myself to utilizing my Big Mother Sauerkraut Jar once again (pictured above). 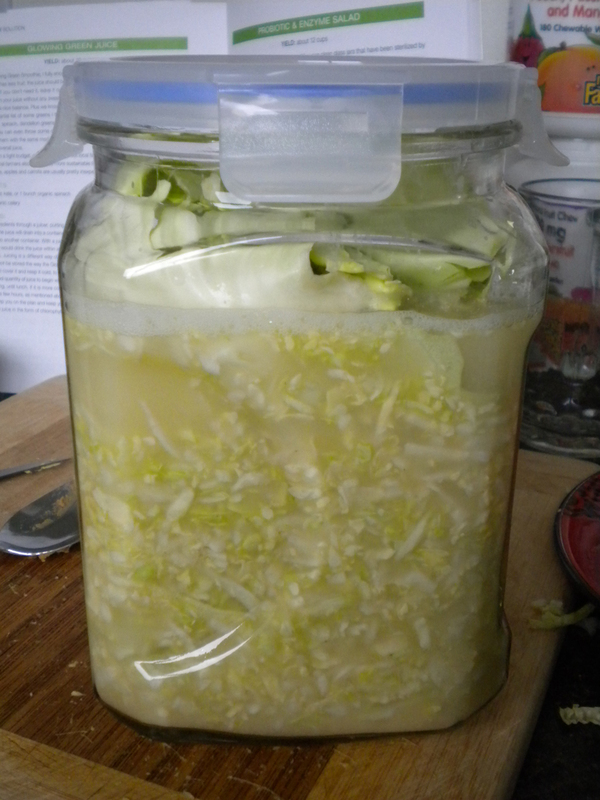 I would just transfer this newly fermented cabbage from the two small jars into the one big jar. Easy peasy, right? WRONG! Because my brain is wired to be School Smart and Not At All Street Smart, I simply opened the first of my stuffed-to-the-top cute jars like I was mindlessly twisting open a container of peanut butter. This was not a wise move. Suddenly unencumbered by the protective vacuum seal, shredded cabbage and brine exploded all over the kitchen (and over my clothes, and into my hair) with the force of one of those t-shirt cannons they use at half time for football games. Kapow!! Fermented juice and smelly cabbage EVERYWHERE!!! On the walls, on the ceiling, on the floor, on the countertops, on my jeans, all over my girly top– sauerkraut was literally everywhere. What a way to suddenly round third base with the otherwise awkward and socially inept cabbage patch kid! Who knew I would get so up close and personal with cabbage?? [This is why I did not take any photos. I was too infuriated and otherwise occupied with picking shredded cabbage out of my ponytail to care about documenting this ordeal on camera.] Through gritted teeth, I salvaged what I could of the mixture, stuffed it into my large jar, and then braced myself to open the second small jar. This time, I opened the jar carefully and in the safety of my kitchen sink. It still went KAPOW! !, but most of the carnage was inflicted on the sink instead of all over the kitchen (and, more importantly, on me!) Again, I salvaged what I could and transferred the cabbage into my Big Jar for fermenting. 1. I’ll know what size of cabbage constitutes a “medium”. 2. I purchased an extra cute jar so I won’t have to stuff my original ones so tightly with cabbage again. 3. I will never again open a vacuum-sealed jar of still-fermenting cabbage right in front of my precious face and slower-than-average brain. It’s not worth it! Update: You can read about my ongoing kraut adventures and try a red cabbage/shredded beet kraut recipe on my more recent post here. See you there!